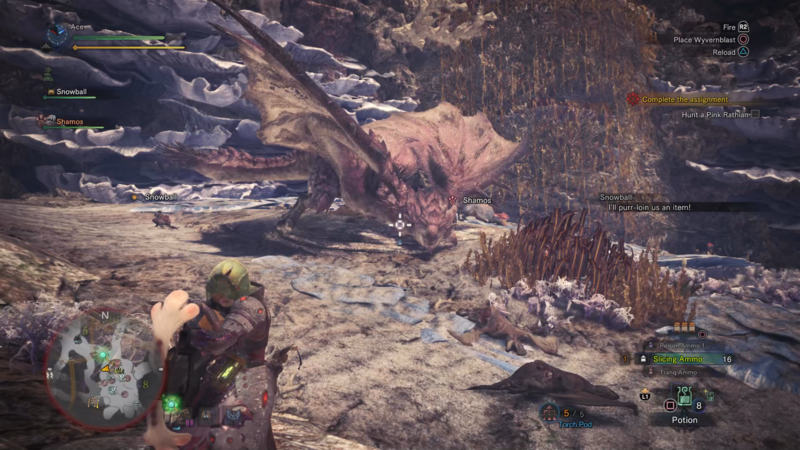 Here's our full guide on how you can go about tracking down and killing the Pink Rathian in Monster Hunter World. There's absolutely no doubting the Pink Rathian as one of the most powerful creatures in all of Monster Hunter World. In this complete Monster Hunter World Pink Rathian guide, we'll be walking you through everything you need to know before you head into battle with this powerful creature. If you need anything else at all on the complex game of Monster Hunter World, including how to safely capture an animal in order to collect rarer monster parts, as well as how to track a monster using the Scout Flies, head over to our Monster Hunter World guides walkthrough hub. The Pink Rathian is the beast that you’ll spend a fair few hours tracking down after you’ve successfully diverted the Zorah Magdaros back out to sea. After tracking the Pink Rathian through the Ancient Forest, Wildspire Waste, Coral Highlands, and Rotten Vale, you’ll eventually be tasked with killing the Pink Rathian in the Coral Highlands, where it’s made its lair. The fight ahead of you is a tough one, and the Pink Rathian is widely considered to be one of the toughest enemies in Monster Hunter World. Make sure you’re stocked up on Herbs, Potions, Antidotes, and Mega Potions before you embark on the quest to battle the Pink Rathian, as you’re dropped straight into the fight with the beast right from the beginning of the story quest. The Pink Rathian is exactly like the base Rathian, except it’s obviously pink, and a lot stronger. One of the Pink Rathian’s most deadly weapons is still its tail, which it’ll use to slash at you from above, and this devastating attack can easily take off half the health of even the most well protected hunters. To add insult to injury, the Pink Rathian’s tail can also deal out poison damage to the player, and although this won’t consistently activate every time the tail hits you, we’d strongly recommend taking the maximum amount of ten Antidote potions with you to fight the monster. 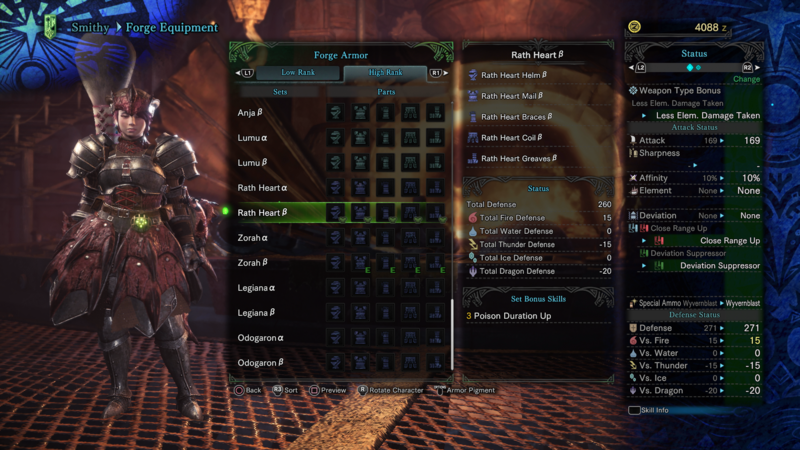 It goes without saying that want to prioritize gear that gives you the best defense statistic for the battle against the Pink Rathian, but you’ll also want to take armor that protects you against fire. 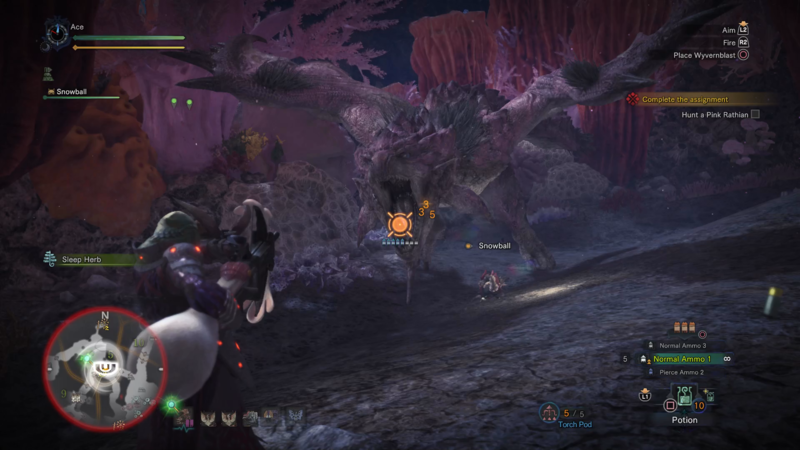 The Pink Rathian can shoot one, two, or three fireballs out of its mouth at you in one go, any of which can prove deadly to hunters on less than two thirds of health. Although the Pink Rathian can breathe deadly fire, its head is also a weak point, as is its tail. You can actually chop off the tail of the monster if you’re using a bladed weapon (Dual Blades, Switch Axe, Long Sword etc. ), and not only does this take a deadly weapon out of the battle, but it also gives you an extra monster part to harvest when you get a moment to catch your breath. Speaking of weapons to use against the Pink Rathian in MHW, we’d recommend speed over power. 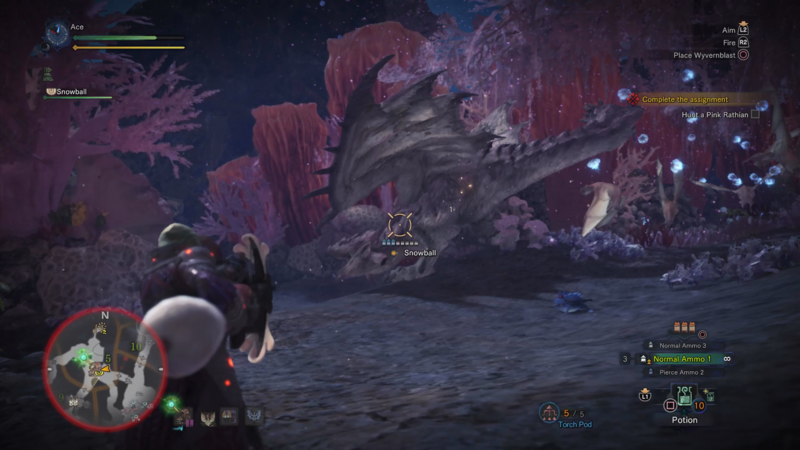 A ranged weapon like the Bow or Light Bowgun is a great option for fighting the Pink Rathian, as is the Dual Blades, Long Sword, or Insect Glaive, all of which can cut the tail off the monster. The fight against the Pink Rathian can become incredibly drawn out, especially if you get other Coral Highlands monsters like the Legiana or Tzitzi-Ya-Ku interfering in your fight. Make sure to stock up on Potions, Antidotes, and effective armor, and you’ll be more than a match for the powerful Pink Rathian. One device that can be particularly deadly against the Pink Rathian is the Flashfly Cage for your Palico. You can obtain the Flashfly Cage by completing the Grimalkyne Tribe quest in the Ancient Forest, and to equip it to your Palico, simply head into your private quarters in Astera and talk to your Palico in your room. The Flashfly Cage lets your Palico periodically place down a cage on the battlefield, which you can then activate to temporarily stun the Pink Rathian, a great tactic while it's in the air. Now that we’re done with this monster in MHW, why not continue to any of our other Monster Hunter World guides, including our full weapons guide, as well as our guide on the high rank armor.